The problem: Had crappy day. Cannot eat when sad. The thoughts that occupy my head are these: Sadness and chocolate. Sadness and cheese. Sadness and avocados. The avoidance strategy: Shoe shopping. Clothes shopping. Pedicure. Manicure. Haircut. Then what: I have to eat. It is absolutely necessary. Solution: Eat healthy. No chocolate. No cheese. But some seriously beautiful avocados. Blossoming Lotus. 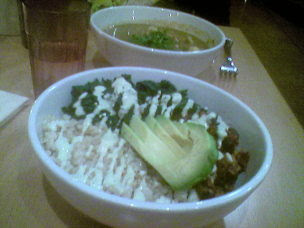 I get the Southwest Bowl with hearty brown rice, hot vegetarian chili with something that tasted like meat but wasn't actually made of animal, steamed greens (kale, I think) creamy avocados and sour cream. 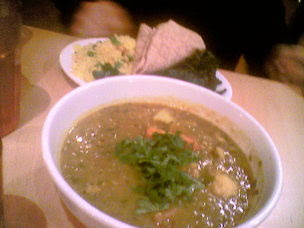 Kristin gets curry with rice. We watch yoga types hugging and bonding while we eat and discuss (quietly, at the request of the sign on the table) why we love eating healthy. Happy Ending: I am full. I am now educated on living (raw) foods. (Thank you, waiter with blonde beard.) I am motivated to take yoga and bond with fellow yoga types. I am confident having eaten a hearty, healthy and delicious meal and having spent lots of money on myself that things will cheer up brilliantly. Why this is good for you: December happy hour with things like Live Nachos, Cashew Hummus from 8pm - 10pm. How often do you eat things like nachos and not feel guilty? This is your chance, my friend!